SEATTLE—Today, 2.1 billion people – nearly 30% of the world’s population – are either obese or overweight, according to a new, first-of-its kind analysis of trend data from 188 countries. The rise in global obesity rates over the last three decades has been substantial and widespread, presenting a major public health epidemic in both the developed and the developing world. 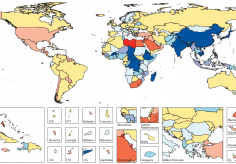 Published in The Lancet on May 29, the study, “Global, regional, and national prevalence of overweight and obesity in children and adults during 1980–2013: a systematic analysis for the Global Burden of Disease Study 2013,” was conducted by an international consortium of researchers led by the Institute for Health Metrics and Evaluation (IHME) at the University of Washington. Overweight is defined as having a Body Mass Index (BMI), or weight-to-height ratio, greater than or equal to 25 and lower than 30, while obesity is defined as having a BMI equal to or greater than 30. The results are also available in an online tool at http://vizhub.healthdata.org/obesity. Over the course of the study, rates of overweight and obesity among adults have increased for both men (from 29% to 37%) and women (from 30% to 38%). In developed countries, men had higher rates of overweight and obesity, while women in developing countries exhibited higher rates. Also in developed countries, the peak of obesity rates is moving to younger ages. Looking at individual countries, the highest proportion of the world’s obese people (13%) live in the United States. 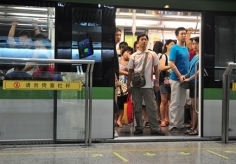 China and India together represent 15% of the world’s obese population. Rates in the study were age-standardized, meaning they were adjusted for differences in population size and ages over time and across countries. Among children and adolescents, obesity has increased substantially worldwide. Between 1980 and 2013, the prevalence of overweight or obese children and adolescents increased by nearly 50%. In 2013, more than 22% of girls and nearly 24% of boys living in developed countries were found to be overweight or obese. Rates are also on the rise among children and adolescents in the developing world, where nearly 13% of boys and more than 13% of girls are overweight or obese. Particularly high rates of child and adolescent obesity were seen in Middle Eastern and North African countries, notably among girls. Regionally, countries in the Middle East and North Africa, Central America, and Island nations in the Pacific and Caribbean have already reached exceptionally high rates of overweight and obesity – 44% or higher. 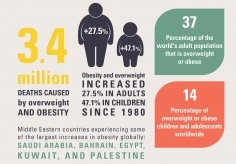 In 2013, the highest rates of overweight and obesity were seen in the Middle East and North Africa, where more than 58% of men and 65% of women age 20 or older were found to be either overweight or obese. More than two-thirds of the countries in the region had overweight and obesity rates of over 50% in adult men and women. In Central America, more than 57% of adult men and more than 65% of adult women were overweight or obese, with the highest prevalence – greater than 50% among men and women – found in Colombia, Costa Rica, and Mexico. In the Pacific Islands, nearly 44% of men and more than 51% of women are overweight or obese, as are nearly 38% of men and more than 50% of women in the Caribbean. While the percentage of people who are either overweight or obese has risen substantially over the last 30 years, there have been marked variations across regions and countries. In developed countries, increases in obesity that began in the 1980s and accelerated from 1992 to 2002 have slowed since 2006. Conversely, in developing countries, where almost two-thirds of the world’s obese people currently live, increases are likely to continue. In six countries, all in the Middle East and Oceania – Kuwait, Kiribati, the Federated States of Micronesia, Libya, Qatar, and Samoa – the prevalence of obesity for women exceeds 50%. In Tonga, both men and women have obesity prevalence over 50%. In sub-Saharan Africa, the highest obesity rates (42%) are seen among South African women. Health risks such as cardiovascular disease, cancer, diabetes, osteoarthritis, and chronic kidney disease increase when a person’s BMI exceeds 23. In 2010, obesity and overweight were estimated to have caused 3.4 million deaths, most of which were from cardiovascular causes. Research indicates that if left unchecked, the rise in obesity could lead to future declines in life expectancy.